En recension av Minneapoliskonserten av melodicrockconcerts.com, läs och njut av bilderna. There’s really nothing changed about a KISS concert in three decades, but yet the band and its fans seem to reinvent themselves each night when showtime arrives. For some, Saturday night’s concert was a chance to emulate legendary rock personas with makeup and costumes, and for others the opportunity to sing along to timeless rock classics was more than enough excitement. But for everyone, it was a shared and unforgettable evening of glorious rock and roll. One quick glance around the Target Center at 9:00pm revealed that the concert was sold out for all intents and purposes, and that full “sold-out sound” arrived when the lights dimmed and guitar tuning could be heard from behind the curtain bearing the band’s logo. The chords of “Deuce” hit the crowd like a wrecking ball as Gene Simmons, Paul Stanley, and Tommy Thayer emerged behind the dropped banner in full rock star glory. The lights shined as bright as the sun, while the sound convinced every fan that they were rocking out at the loudest concert that ever came to be. Those first moments of a KISS gig are almost beyond belief as every story, myth, and legend of the band’s shows comes to fruition before the eyes of thousands. The well-known hard rock hits from the group’s early history kicked the show into motion, and when he wasn’t jumping high into the air, Paul Stanley was singing as if there was truly no tomorrow. The microphone stands on stage don’t get much use during the first two songs as the band prefers to deliver the music much closer to the fans. Gene Simmons stood triumphantly near the edge of the stage and allowed his tongue to shorten the crowd-to-band distance even further. When all three guitar players gathered center stage to jam in unison, a flurry of flashes from the crowd erupted in an attempt to capture the moment. It was flames that erupted from the floor for the signature “Hotter Than Hell“, and Tommy Thayer got his turn at the microphone during “Shock Me“. “Nothing cures the swine flu quite like Dr. Love,” proclaimed Paul Stanley as the band ripped into the instantly familiar chords of a mid-seventies rock anthem. The band may be celebrating their 35th anniversary, but there’s no denying that time has only seen KISS grow bigger and better. Although the songs granted millions of radio plays over time emerged as the real crowd pleasers and took the prize in the audience sing-a-long category, the crowd gathered in Minneapolis was truly ready for anything. Stanley introduced new track “Modern Day Delilah” as a prime example of the theory that being old isn’t a prerequisite in a song’s journey to becoming a classic. Fans sang along to the vocally demanding number and screamed with excitement when Stanley delivered a handful of glass-shattering high notes. Not to be outdone, it wasn’t long before Gene Simmons took the performance to new heights – literally. After engaging in a blood spitting rage (the fire-breathing earlier just didn’t do the trick), Simmons was lifted to a new location – atop the arena’s lighting equipment. Stanley earned the spotlight later as he flew high above the floor to deliver his famous struts and riffs from the other side of the venue. Becoming lost in the spectacle was a natural reaction to the kind of youth-driven rock and roll that KISS delivers. When all was said and done, the band left a speechless crowd. Although the make-up surely hides a wrinkle or two, the realization that men near the age of 60 just finished stomping and jumping around in six inch platform shoes is nothing to sneeze at. 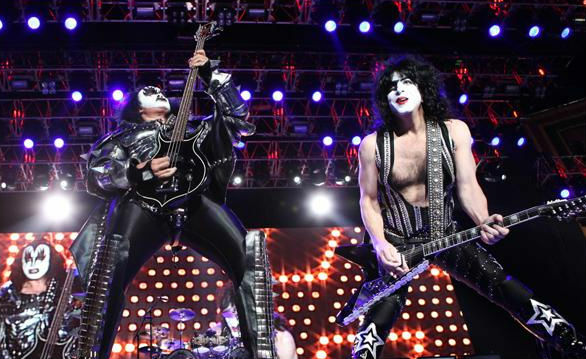 When it comes to staying ageless, KISS just might be onto something.